Dr Simon Gowda investigated a sudden onset of eye pain in an elderly male patient. 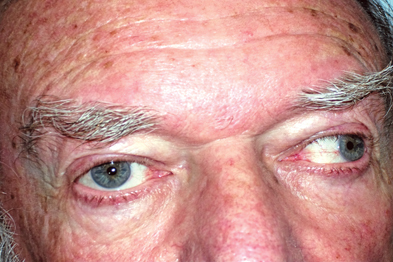 A 74-year-old man presented with a sudden onset of pain around his right eye. This had never happened before and there was no significant past medical history. He was a nonsmoker. He also complained of double vision. He was taking amlodipine for hypertension but nothing else. His BP was 140/90mmHg. Examination revealed papillary reflexes to be intact. There was no increase of pain on eye movements. A ptosis was evident. The right eye movement itself was limited. An urgent referral was made to the on-call ophthalmology service. At the clinic papillary responses were found to be equal and correct. Eye movements were impaired in all positions of adduction and the pupil only just crossed the midline. There was a 75% limitation of right elevation and 100% limitation of right adduction. Visual acuities were 6/6 in each eye. Fundus examination was normal. A same day head CT scan showed no space-occupying lesion, no ethmoidal abscess or medial rectus myositis. 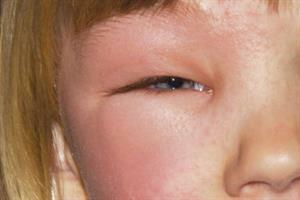 A diagnosis of a pupil sparing third nerve palsy was made. The patient had a series of routine blood tests including FBC, ESR, TFT and glucose, all of which were normal. Microvascular aetiology was suspected. The patient was treated conservatively with an eye patch. He was started on aspirin and a statin and kept under regular review. He went on to make a full recovery. Third nerve palsies are perhaps the easiest eye palsy to diagnose. There are many causes of a third nerve palsy and a clue to the aetiology may be gleaned from the patient's medical history. A pupil-sparing third nerve palsy is usually because of diabetes or some other vascular risk factor and can be safely managed in an outpatient setting. A pupil-sparing third nerve palsy is often termed a medical third nerve palsy and is due commonly to an ischaemic event. Compressive lesions tend to involve the pupil. This is because parasympathetic pupillary fibres run along the surface of the nerve, making them susceptible to compression. Oculomotor nerve palsy is easy to detect because it looks dramatic. The majority of the extraocular muscles are innervated by the third nerve, so when compromised, the eye deviates down and out.